Kidliterati: Secrets of Kidlit: Spotlight on WHO WINS? Secrets of Kidlit: Spotlight on WHO WINS? THIS BOOK!!! I was super lucky to receive an advanced copy from Workman Publishing and, I'm telling you, it has brought us hours of fun, laughs, crazy scenarios, and learning. My girls and I have discovered some of history's baddest, coolest, craziest, most interesting and influential personalities, many of whom we'd not heard of. Mostly, anything that has us pitting Pablo Picasso with Joan of Arc in a babysitting battle is solid gold! The book is gorgeous... spiral bound, lovely illustrations, and made in the quality we've come to find with Workman Publishing. It's a sort of flip-book, so you can randomly pick the battle and opponents or intentionally choose who you'd like to see go head-to-head. Author Clay Swartz provides a short bio along with a few quirky facts about each individual. Key attributes one might need to win the specific battles are also provided. For instance, say the battle is a karaoke sing off. To do well, a contestant would ideally want to be brave, have a bit of charisma, and a certain level of intelligence. Keeping that in mind, at the bottom of the page, the reader will find each historical figure's personal attributes are rated on a scale of 1-10. So, really, you've got everything you could possibly need to responsibly choose a winner. But, of course, much debate is sparked=super FUN! WHO WINS? will be available July 12th, 2016 and is up and ready for pre-order from all of the usual bookish places. Definitely check it out! 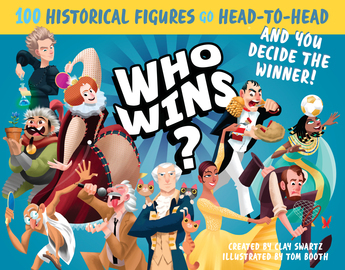 Be sure to enter the GIVEAWAY for a chance to win your own copy of WHO WINS? (US only)!